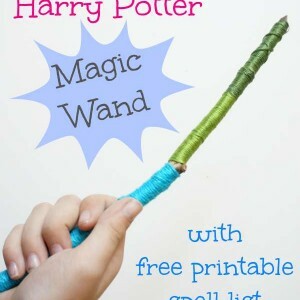 Play this Would You Rather Harry Potter game with kids or all ages…or adults of all ages! How will you answer the questions? You know how much we LOVE creating Would You Rather games for kids…we have created a Christmas game, an Easter game and a Halloween edition. 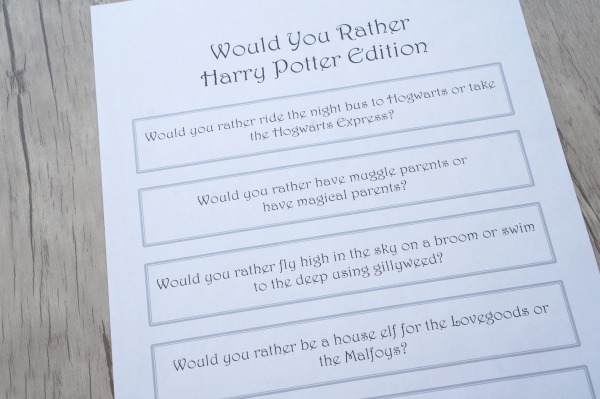 Then the idea popped into my head to create a Would You Rather Harry Potter Edition. Combining our love for Harry Potter with our favourite game. 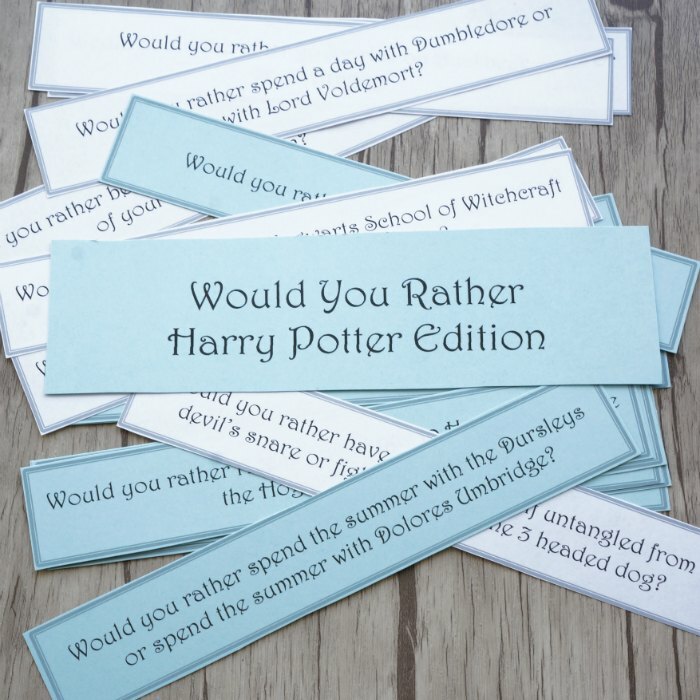 How excited am I to be putting together our Would You Rather Harry Potter Edition? So EXCITED! This one was super fun to create. 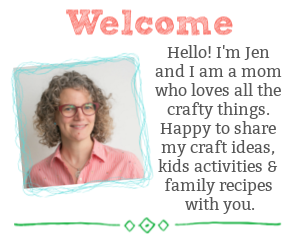 My youngest daughter was home sick the other day (okay, not such a fun start to the story) and when she started feeling a little better we sat in the living room and brainstormed our way through this entire list…we also worked on another theme…coming soon! My daughter and I are MAJOR Potterheads. We pride ourselves on our level of knowledge of the books and the movies. So, these questions are based on both the movies and the books. We think we’ve put together some tough questions for avid Harry Potter fans to ponder. 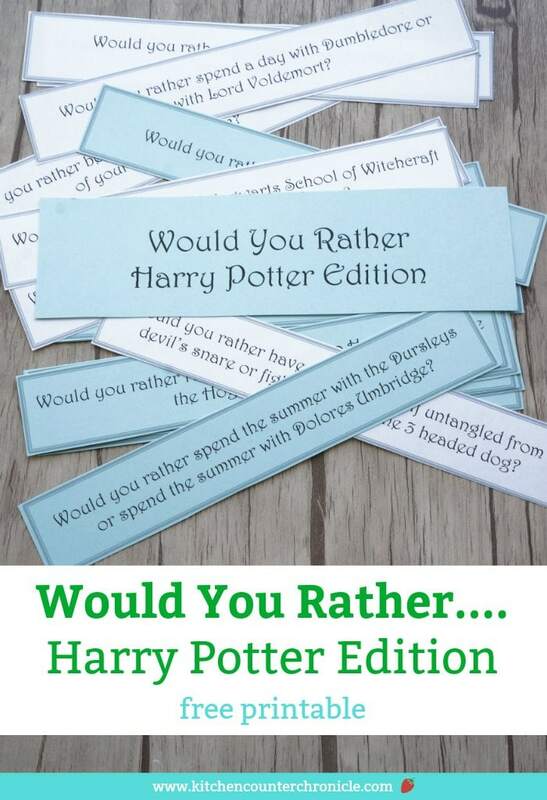 All you have to do is print off our copy of our Would You Rather Harry Potter Edition game. 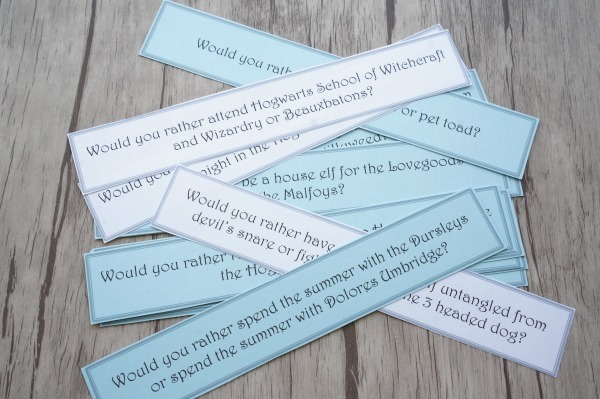 Then cut out the individual slips of Harry Potter would you rather questions. Would you rather spend the summer with the Dursleys or spend the summer with Dolores Umbridge? Would you rather have to untangle from devil’s snare or fight the 3 headed dog? Touch choice – don’t you think? 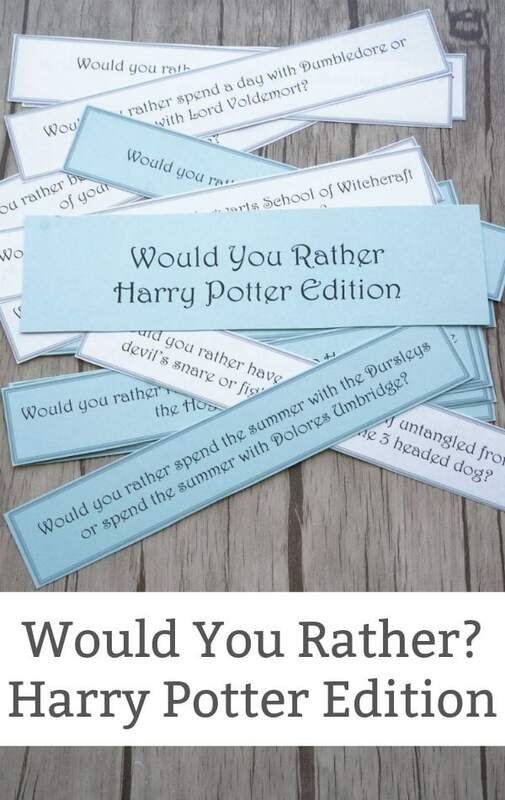 Simply print off our Would You Rather Harry Potter Edition, cut out the questions and have fun. Would you rather be sorted into Gryffindor, Slytherin, Ravenclaw or Hufflepuff? Or, is that a question that only the sorting hat can answer? 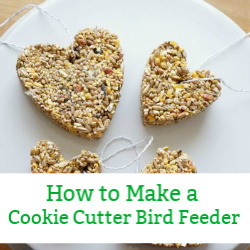 pop them in your kid’s lunch bag. I love the silly and sometimes serious conversations that are sparked from these questions. What Harry Potter would you rather questions would you ask? 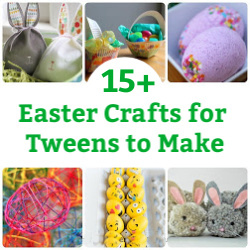 Share your ideas in the comments below or send me an email ki[email protected] I’d love to hear what questions your kids (or you) come up with. I could even add them to the game! What’s your patronus? 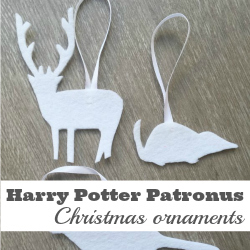 Make your own patronus shaped Christmas ornament. These Harry Potter ornaments are so lovely to hang up all year round.